In Wii Baseball you get to take turns pitching and hitting each inning. To win the game and become a pro baseball player, you must master both. When throwing a pitch how quickly you flick or swing the remote, coupled with your choice of pitch, determines how fast of a pitch you throw. To throw a really fast pitch, work on flicking the Wii-mote quickly without selecting one of the special baseball pitches. 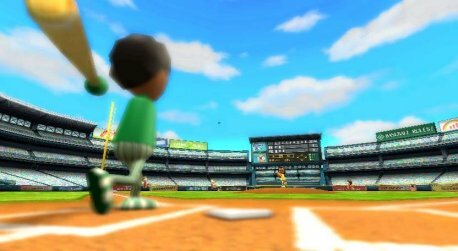 With Wii Baseball you can throw different types of pitches by pushing A (Screwball), B (Curveball), and A+B at the same time (splitter). You can also select the pitch location (inside, outside, up, down) by using the control pad. Tip: If your playing another person in Wii Baseball (not the computer), try throwing lots of splitters. They can be hard to hit. Tip: Mix up your pitch types and location when playing the computer. If you keep throwing the same pitch over and over, the computer is going to hit it. The key to hitting the baseball is timing. Hit the ball too late or too early and it will go foul. The best way to get better is practice, practice, practice. You will find that hitting gets much easier the more you play. Tip: Swing up to try and hit a home run. Warning�if you swing to high you will hit a pop fly and get out.